Classic Pup 2.14xRC5; Puppy Linux 4.1.2 / 4.3.1; Wary 5.1.1 / 5.1.4.1. Includes background / window themes similar to WinXP / 2000 / 95. * Menu / Filesystem / ROX-Filer file manager. * Right-click in window; left-click Options, then Pinboard. * Look under Appearance section. Make icon text color white by clicking on Foreground: and changing Color name: to #ffffff. Font style and size can also be changed here. XP-style background (litrix_q85.jpg) is the last revision pakt posted here. XP-style “Start” icon was posted by UberNoob here. Everything needed for optional “Start” icons is included in the attached .tar.gz file. Just download, click on .tar.gz, Select All, then Extract. Got the sudden urge to defrag an hard drive and do an virus scan.
" Got the sudden urge to defrag an hard drive and do an virus scan. " A priceless comment....nearly choked on my Weeties. Seriously though harii, like Chris, I nearly choked on my coffee when I'd read that comment. LOL! But once again Dewbie - you've done an excellent job with your theming work here! While I've never run XP/2000 myself, I've seen my son's copy of XP when he used it ( before I converted him to Puppy of course! ) and your theme is VERY convincing indeed. These would be really great themes to use for friends who experience difficulty in coming over from said systems to Puppy ( although I don't see why anyone would ever have difficulty... though I've been told I do live in an Ivory Tower. LOL! ). Thanks for your continued hard work towards improving Puppy for all Dewbie. Excellent job! You can download the XP "Bliss" wallpaper for free. I didn't post it here because it's copyrighted. From memory, I seem to recall that my Windows installation usually looked a bit different to these - most of the time the screen showed a dark blue background with a techy looking sentence in white text. 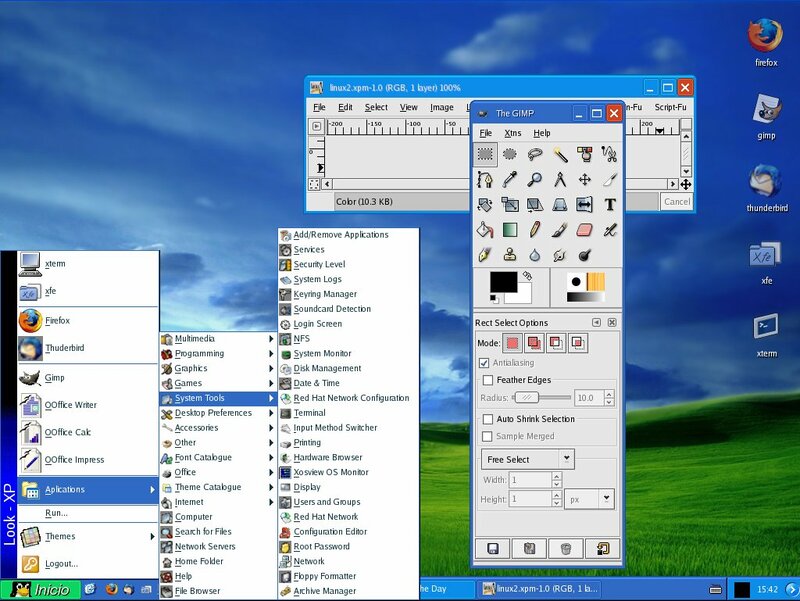 Free software has it's own beauty, so... ¿why do people try so hard to emulate Windows look and feel? I'm not complaining, it's just curiosity. why do people try so hard to emulate Windows look and feel? For the challenge, I suppose. Also, newcomers sometimes request a Windows-themed desktop.